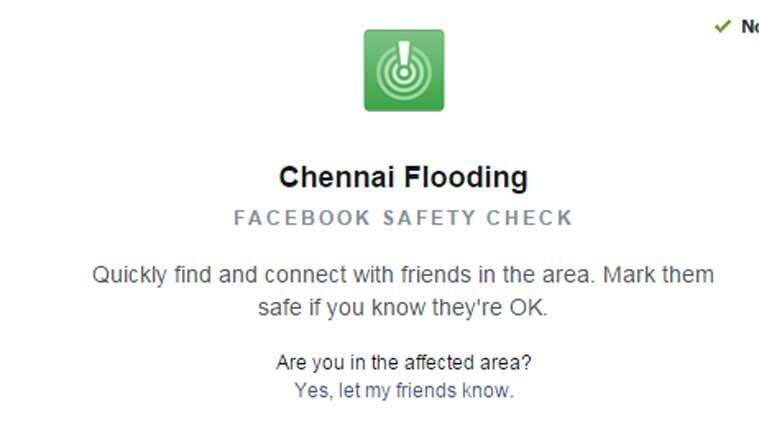 New York, Dec 3 (IANS) Facebook activated the “Safety Check” feature for its users in Chennai early on Thursday, while Google has compiled all critical information under its “Crisis Response” tool to provide them relief in the flood-hit city, media reports said. As the torrential rains in Chennai continued for the fourth straight day, with power and telephone lines down in many areas owing to flooding, Facebook’s Safety Check feature would allow people to mark themselves as “safe” from the floods, Time reported. The feature, which debuted in October 2014, allows Facebook to ask users whether they’re safe if located near a natural disaster. A click or tap on the “I’m Safe” button lets friends and loved ones know straight away. Users can also check to see whether their friends are safe too. Facebook’s Safety Check feature has now been deployed on several occasions, the most recent being last month’s terrorist attacks in Paris. Fundraising campaigns are also afoot on social networking websites. “Help us get food and other essentials to those stranded in Chennai due to floods,” reads a link shared by a Facebook user, Satish Sabapathi. “Here is little something we can do to our brothers and sisters in Chennai. The fundraisers are doing an amazing job of providing food and basic support to all the affected people. Let’s give our share of support my dear friends,” says Sabapathi is a post. Zahid Ali, another Facebook user from Kanchipuram in Tamil Nadu, was all praise for social media. “Thanks for social media [like] Facebook for helping the people [stranded] in the Chennai flooding,” his post says. In an effort to provide all critical information related to floods in the city at one place, Google has created the Crisis Response tool — “South India Flooding” — which enables users access to emergency helpline numbers, crowdsourced list of places and people offering shelter, map of crowdsourced flooded streets and other such important information. It also offers important tweets, updated news and videos on Chennai floods. The torrential rains in Chennai have impacted normal life, with millions struggling to cope with lack of basic necessities on Thursday. Floods caused by the heaviest rains in some 100 years have kept the city under a sheet of water, leaving 269 people dead. Many people were stranded in their homes, with the army and air force deployed for rescue operations across the city.